will this valuable amenity still be available for future generations? 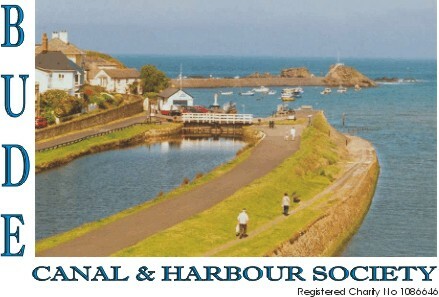 The Bude Canal & Harbour Society was formed in 2001 by local people who support the above proposals. i) to preserve, conserve and encourage restoration of the Bude Canal where possible. ii) to advance public education in the history and former use of the Bude Canal. We invite you to join the Society.Your annual subscription will be used to finance the activities of the Society. Membership subscriptions will be due on the 1st September of each year. Any member joining the Society after 1st June will not need to renew their subscription until 1st September of the following year. A quarterly newsletter, providing you with the latest information of our achievements and forthcoming activities. Contributions for possible inclusion in this from members are welcome. An Annual Meeting with guest speakers and visual presentations. Guided walks along parts of the canal, including sections not currently open to the public. Access to the Society's historical and current information. Persons joining later in the year will receive back copies of all Newsletters published already in that membership year. Please consider completing the Standing Order Mandate and/or the Gift Aid Declaration. They both assist the Society greatly in administration and in obtaining refunds from the Inland Revenue at the rate of 28p for each '£' of subscription or donation. To ease administration, the Society holds its members' records on computer. Disclosure of individual member's details will only be made to officers of the Society, to other members or affiliated members, and only in connection with activities related to the aims of the Society. If you object to your membership details being held on computer, please say so on your application form. If you do object, then your records will be held separately from the computer.